He stood at his register mindlessly passing the goods from Mrs. Fromeyer’s cart, one at a time, across the scanner. He waved each item back and forth over the single, red-flashing laser eyeball of the machine that logged the purchases until it noted success with a short, innocuous beep. Words flashed across his mind as he sought out just the right one. Style? Flair? Zest? Yes, panache was it to a T. It felt like an old word. Like something his grandmother might say, but it fit April and what she was doing in this moment perfectly. While he scanned by rote, April talked to people. She was genuine. She cared. She gave little tidbits of information about the products the people were buying and asked them about their day. Even though she had a scrunchy at the ready on her wrist, she kept her hair down most of the time. It constantly fell across her face, which required that she constantly pull it back and tuck it behind her ear. An exercise in futility for the hair, but for him each pull back revealed that amazing smile. It hit him like a kid watching a magician pulling his cape back to reveal the end of an amazing illusion. Barton looked around the store. Most people don’t smile. Mrs. Fromeyer wasn’t smiling. He wasn’t smiling. They were all capable of smiling, sure, but everyone seemed to dole them out as if they were a precious and limited resource best used exclusively for special occasions. Not April though. If smiling was a precious and limited commodity that should be tightly managed, nobody told her. She had smiles for everyone. She had smiles for no one. She looked as though she could have been born with a smile on her face. She could have been the hardest birth known to humanity and Barton could only imagine the new infant April lying in a small hospital crib and struggling to “make it” – all while smiling. It was a sweet smile, natural and full. It fit her face perfectly. It never faded. If it ever went away, and he was pressed to think of a time when that happened, you could rest assured that a new fresh smile was coming up to take its place any second. When some people smile, it looks forced, fake, off-putting in some cases and foreign in others, as if gracing the face it sat on was a mistake. It’s not that these people are unhappy, but more that they are not properly gifted with adequate smile features. April’s face was made for smiling. Whatever bone structure and musculature nature set up for her provided the optimum conditions for maximum smile efficiency. She had more than a mouth smile. Her whole head was symmetrical and balanced. The trigger of the smile caused her eyes to widen just so to add that extra gleam to them and a subtle, soft blush would grace her cheeks with just the right amount of color. It was art. She was smile incarnate. He could imagine her face on magazines, billboards, giant animated screens and on TV, not hawking cars and overpriced, sludge-creating, high-speed juicing machines, no. That did not suit her. Instead, she would represent ideals, assurances and lofty aspirations, inspiring those seeking help or who search for a pathway to a better existence to take those steps needed to be who they want to be in this life. Quit smoking. Read books. Meditate. Recycle. Save puppies. Feed the homeless. Use energy efficient LED light bulbs. Retire at Shady Oaks. Consider Tyler Funeral Home the best option for your loved ones as they head to the great unknown. And more. He knew he was staring. He tried not to, but still he found himself looking without looking, gauging her movements to make sure that if she were to look up, he could effectively shift his gaze off to some other direction without getting caught with his eyes on her like some distant, creepy, stalker. He was not proud, but it could not be helped. In his 19 and three-quarter years of life, he had never encountered such a force. It knocked him off balance. Yet, in 19 and three-quarters years of life, he still he knew well the notions of fate and impermanence. His best friend “for life” David Berkingham moved away that fateful day in June the year they both turned eight and look how that turned out. It was like David never existed. Nothing lasts forever. So if the universe saw fit to align his path with that of April Timmons and the smile that could generate universal peace and harmony, who was he to argue? To read other story entries, just search for On any given day at the top of the page. This entry was posted in Fiction, Humor, On any given day, Slice of life and tagged blog, creative writing, fiction, funny, human interest, human nature, humor, insightful, On any given day, original, philosophy, relationships, slice of life, writer on June 8, 2018 by The JEFFWORKS. 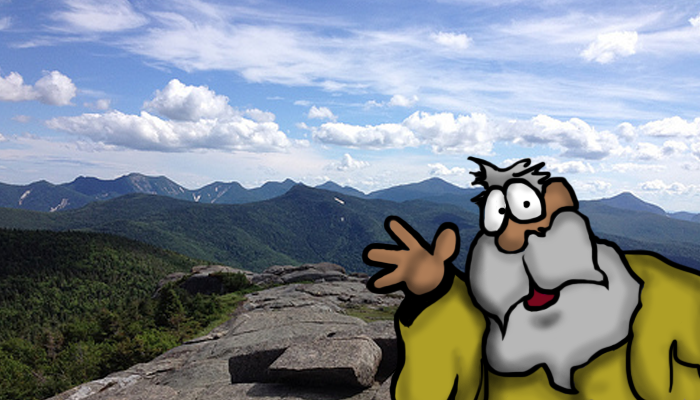 Sage advice from an elderly gentleman perched atop a lonely Mountain. Hello friends! Today our question comes from Myrtle Trisk of Portnoy, North Dakota. I say because, because there is really no better answer to that question, at least as Myrtle poses it. It is what some might refer to as a “loaded question.” For without context, the ability to assist her in reaching a higher level of enlightenment is greatly diminished. Despite our very best efforts, to try and divine a satisfactory response that helps illuminate the pathway to resolution related to her specific need is very much like trying to lasso a single star in the great universe that surrounds us. Let us try instead, to better understand what drives such a question, to then see if a more reasonable answer will present itself. First, Myrtle is not alone in her search for the answer to this question. Many write to Banaba asking the very same thing with varying levels of related information. But the question itself seems to be more an expression of frustration. The motivation to ask the question comes when understanding the actions of those around us – both in circles close to us and those in representational groups we are forced to recognize – eludes us. As an example, let’s say that many users of the Internet start responding to a common and widely dispersed post that asks, “What kind of cat are you?” You begin to see tens, then hundreds, then thousands of responses from some of your very closest friends and family members to throngs of total strangers, which define for you, and each other, what kind of cat they are. We know, of course, they are not currently and never will be a cat. Let’s say too, that you do not like cats in the least. Let us say finally, that you find this kind of mindless group exercise to be a fruitless and meaningless waste of time. You will certainly not be playing the game, for you could care less about what kind of cat you are. In fact, we could go as far to say that your strongest desire might be to post something completely contrary (like being a dead cat) that would wrinkle the noses of those who are playing the game. You don’t really need an answer. You need a better question. You need to release frustration that comes with trying to figure out what you may never know. You need to understand that the energy put into figuring out why people do what they do, may never result in an answer that gives you great insights, for the moment you think you’ve seen it all, a whole new crop of stupid is almost certainly guaranteed to rise up and greet you. Why do I allow people who act contrary to my personal sense of, or definition of intelligence, distract me so that it restricts the progress I make on my personal journey to enlightenment? Remember too, the you may at one time or another, do something that falls outside of someone else’s personal definition of smart. You will be a distraction to their focus, which feeds the pool of their frustrations, and they may one day write Banaba a letter about you. This entry was posted in Banaba, Something To Ponder and tagged Banaba, blog, creative, fiction, human interest, human nature, humor, insight, insightful, original, quirky, relationships, slice of life, Something To Ponder, writing on January 29, 2016 by The JEFFWORKS. Taffeta stirred awake from a light nap, as the waiter, whose name tag identified him as Damerae, placed their drinks on the small table next to their lounge chairs. “Yes, ma’am,” Damerae said with a wink. “I’ll drink to that,” Taffeta said, lifting her glass. She let the cool, fruity concoction work it’s magic and closed her eyes again behind her large sunglasses. In the dark, the shadows of the past rose up as they always do now. The imprinted residue of resilient memories that can’t be erased, but instead, must be endured until they fade away of their own volition. A shadowy room materializes, strewn with the bodies of those unfortunates who lurked in alleyways and around corners waiting for a crack at an easier life, but always at the expense of another. Bright spatters and dark puddles of blood broke up the monotonous, dusty grays and dingy browns. The smells of dirt, mold, decay and gunpowder mixed in a choking, nauseating haze. Once again Myrna stands with her outstretched arm holding a smoking, hot Cora covered by a patent leather purse now with a sizable hole in the side. The long and broken couch. The money. Yes. Even in the midst of chaos and fear and death, the siren call of money is strong and clear and seductive. It was just the two of them, the bodies and the money. “Wait? Wait for what?” Myrna asked. “How much what? How much more mayhem we can get into? No thank you!” Myrna turned again to leave, but Taffeta held strong. Taffeta spun away from Myrna and stared into the shadows, at the bodies and the ocean of bills that poured from the boxes Petey tipped over. It took them a while, but they loaded quite a few boxes into the car that waited for them outside. There was too much to count right there. It was all sort of thrown together. And there was the matter of the three dead bodies. Once they decided to move on their idea, the ladies moved effectively. For as troubled as he was, Danny Mackenoy, the New Capone, did a fair job of gathering up quite a lot of money. Who knows? If he stayed away from the drugs himself, it might have dawned on him that he was close to getting exactly what he wanted. They took what felt right. Nothing more. It came as a silent decision between them after loading one of the boxes into the car. At one point or another, it just seemed like enough. Once they were loaded, they made certain they had all their belongings, and they crawled into the car and headed home – at last. About halfway home, they found a payphone and called the police. They didn’t know that address specifically, but they gave the general area and expressed concern over what they were certain was gunfire before hanging up. Once at Taffeta’s house, they ate and had a good sleep before they started rooting through the boxes of money in the front room. With few expectations, it just became clear that it was a lot. Anytime they came across a random pill or other chemical, they promptly flushed it down the toilet. They split the money into two piles then sat down looking at them for the longest time wondering what next. Two days later, the story all but evaporated from the headlines, due to a warehouse explosion on the other side of town with the potential of releasing toxic smoke that posed a danger to the local population. Taffeta called Angela Deffert of Deffert, Smith and Deffert, blah, blah as her brother did some time ago. Proper and professional, Miss Deffert acknowledged the memory of working with Taffeta’s brother and the firm’s handling of his affairs, including the distribution of the various crates that he left in his will. Miss Deffert confirmed that Taffeta’s brother had indeed secured their services, not only because they were a top ranking firm, but for their reputation for being discreet. In short order, Taffeta and Myrna had set up the money in a living trust with conditions suitable to their liking. They arranged for the pick up, delivery and possible long-term storage of a certain crate, which now contained a well cleaned, well oiled and well packed Cora along with the remaining ammunition. “Well, I do declare,” Myrna said, in what was the very passable, if not stereotypical accent of a Southern belle. “Why, with all this heat I fear that I am fixin’ to perspire!” She leaned over and tapped Taffeta on the shoulder stirring her again, from her visit to the past. Taffeta shifted in her chair and draped a towel across her legs. Her gaze moved along the beach and out across the water. She squinted and pushed herself to see as far as she could, far beyond the horizon and up into the sky until the very essence of her soul seemed to melt into the churning warm hues of the evening sun, set to drop away to mark the end of another day. This entry was posted in drama, Fiction, Human Interest, Internet content, Slice of life, The Glorious Sunset of Taffeta Spaulding, Uncategorized, Writing and tagged blog, creative, creative writing, fiction, human interest, original, relationships, senior citizen, slice of life, Tension, writer, writing on January 22, 2016 by The JEFFWORKS. “Myrna, honey,” Taffeta said, softly dabbing her friend’s forehead with a moistened towel. “Myrrrrnaaa,” Taffeta said in a low soft voice, quietly singing out the name and hoping her friend would come to. From the time the clattering sound crawled through the line and reached her ear, it took about fifteen minutes for Taffeta to hang up the phone and get over to Myrna’s house. As the noise registered in her head, the burn of genuine fear and concern filled her chest, for even if Myrna dropped to the ground simply and directly, any fall at their age could be dangerous. It could mean heart attacks, and broken bones, and long convalescences, and pain, and… She shook the thoughts away. Once she pulled into Myrna’s driveway, she immediately went around to the back of the house. Even though she could get a glimpse of her friend lying there in the middle of her kitchen floor, she knocked quickly, to be polite. When Myrna didn’t move, Taffeta tipped up the edge of a small potted geranium, slid out the extra house key made her way in. Dropping her purse and the key as she entered, she ran over to the body as fast as she could without tripping, falling or having a heart attack of her own. She wouldn’t mind, but Myrna would mind a great deal if someone came in and found two ladies of a certain age lying next to each other, or however they ended up dead, on her kitchen floor. Most undignified. Scandalous even. The handset of the phone lay on the floor next to Myrna’s head screeching the high-pitched buzzing tone you get when you leave the line open too long after the person on the other side hangs up. Taffeta reached over and pushed the button marked by the small red phone icon filling the room with silence. Then she moved closer to Myrna, her movements torn between eagerness and trepidation. She inched her ear close to her friend’s face in the hopes of hearing a breath. Myrna obliged by exhaling a soft, thin, raspy whistle of a breath. Taffeta sighed, swallowed hard and allowed herself to draw a deep calming breath for herself. Myrna was alive. And just as Taffeta was about to look for a potential head injury, Myrna countered the exhale with a robust and snarling deep snore that seemed to rattle the floor. Myrna was asleep. Taffeta got herself up, got over to the kitchen sink, moisten a good corner of the towel that sat on the counter and returned to her friend’s side all before the next snore cycle completed itself. Nothing. Setting the towel down on the table, Taffeta reached over and lightly tapped at her friend’s cheek. Taffeta jerked back uncontrollably at the speed at which Myrna’s eyes opened, wide with confusion. A lucky move, for at the same time, Myrna’s arms and legs shot straight out from their resting places and grew rigid, knocking Taffeta back further still. If she were close enough to take the full, direct blow Myrna might have knocked her across the kitchen and into the cabinets. She was not a large woman per se, but Myrna was sturdy and still had a lot of strength left for someone whose primary form of exercise seemed to be walking, worry and hefting the occasional bowl of chips to the couch when she watched her stories on TV. Myrna’s eyes quickly darted back and forth as she tried to steady herself, tried to calm down, tried to recall where she was and tried to recall what the heck she might have been dreaming all at the same time. “Oh my word,” she said. Catching sight of Taffeta rolling backwards, Myrna struggled around to her knees and reached out to catch her friend. Getting a hand on her jacket, she only succeeded in pulling at Taffeta in such a way that she spun away on the smooth linoleum causing her to now fall forward. They both stilled themselves until the motion stopped and the two of them lay breathing heavily in a pile on the kitchen floor. They stayed prone on the floor taking the time to get their breathing and the heartbeats under control, taking personal inventories on whether either of them might have actually hurt themselves. The two helped each other up and plopped down into chairs at the kitchen table. “I’m just making the point,” Taffeta said. “You have to?” Myrna asked. They sat in silence as the small table in Myrna’s kitchen with their arms stretched out toward each other and their hands clasped tight. “I do,” Myrna said. “And frankly, I wouldn’t mind if you ran every one of the…how many bullets did you say you have? This entry was posted in Fiction, Human Interest, Humor, Internet content, Slice of life, The Glorious Sunset of Taffeta Spaulding, Uncategorized, Writing and tagged blog, creative writing, fun, human interest, human nature, insightful, original, quirky, relationships, senior citizen, seniors on February 16, 2015 by The JEFFWORKS. Paul Kilt stumbled through the double glass doors of the emergency room, dizzy, no… light-headed, still moderately coherent…luckily, and clutching the plush towel over the end of his newly stumped left forearm. The lights, while flickering due to the growing storm outside, were still bright enough to make him squint as he took a deep breath and forged on toward the customer intake desk. Thirteen, fourteen, fifteen, sixteen steps to the welcomed support of the faux marble countertop and a certain measure of prevention from landing face first on the floor. His counting steps was something he had done for as long as he could remember. His trying to keep his face from smacking the floor with any ferocity, and losing consciousness, was something he tried to keep from doing since college. On sixteen, he hit the counter hard and leaned onto it with his full weight, puffing out heavy bursts of air to match the effort. He let his head rest softly on the window as his breath splashed itself across the glass in small, temporary waves of condensation. His head swam. His arm throbbed. His legs quivered. He was sweating and shivering all at the same time as his resistance to giving into shock started to falter. The voice was heavy, gritty, and colored by age, countless cigarettes, a measure of malt whiskey and fair amount of contempt for those she spent her eight-hour work shifts attending to. “I’m sorry?” he muttered, still trying to catch his breath. A burly hand reached across and slid the visitor window open with an air of authority. “Incoming patients must stay off the glass, stay off the counter and stay on the line. We will get to you as soon as possible.” The hand then slid the glass pane shut. Paul rolled his head along the glass to where he could see the floor, blurry, but still. “Ha!” he thought. There was a line of tape on the floor about a foot away from the counter. Go figure. He blinked hard to see the end of the clipboard that protruded from the glass partition. It hung in mid air, waiting for him to take it and his place among the others who had brought themselves here for an evening of gentle care and healing. “Sir?” The floating clipboard jutted out a couple of times indicating a sense of urgency. The clipboard hung in the air for a moment longer and then, ever so slowly, receded back to disappear behind the glass. “No,” he shifted again, hoping to ease the throbbing coming from the wound. “And it’s not a dress. It’s a traditional garment worn by men dating back to the 16th century and originating in the Scottish Highlands.” He had explained his name so many times in response to the “dress” question that even in his debilitated state, it just rolled off his tongue. His vision started to blur further, as his head grew heavy. The voice seemed to come from farther and farther away. “Phone number,” the request came more stern this time. This entry was posted in Fiction, Horror, Human Interest, Humor, Insight, Internet content, Kilt, Slice of life, Uncategorized, Writing and tagged blog, blood, creative writing, fun, human interest, human nature, humor, original, quirky, relationships, writer, writing on April 9, 2014 by The JEFFWORKS. The energy exchange of the transformation raged through his entire being and into the small human body. It was delicious. Already he could feel the a new sense of life as he forced his essence into the vessel. Then, like a fast speeding car being tossed into reverse, he hitched. The energy flow crackled and popped in his head. His breath caught he gasped for more air. The little body before him, began to seize. The legs shook and quivered up into the midsection causing a tremor up into his hands where he held the head firmly down to the altar. The connection allowed him to search, something he should have done before he started the transference, but he right sense fell victim to his eagerness, his growing weariness and the prospect of rejuvenation so close. Through the connection, he saw concussion, broken bones, bleeding…injuries substantial enough that the transformation would only exacerbate the problems and make the new vessel a very short -term option, if now viable at all. He reached out toward the beast from the depths, the one who secured the vessel to begin with and who stood by to protect them both and ensure the transformation was completed. His arm shook as it flexed with power that rippled down to his clenching fist and he released it at the creature who exploded into flame and ash, once mighty and powerful, now pushed back down into the earth by pounding droplets of rain. He stumbled again with a rage so thick and complete that he saw little else but more fire. He swung an arm backward knocking the altar askew and sending the once to be great host to the ground and back into the mud. He reached down for the boy with the intent of tearing him into oh, so many parts and pieces. The boy struggled to move, propping himself up onto his elbows in a lackluster effort to crawl away to safety. He reached down to exact the punishment for being broken when a scream came from the darkness. In a full-out sprint, Taddy screamed from the moment he pushed away from the side of the house to the moment he leapt at the creature. It was all his brain would allow. It was everything he needed to express. With the kitchen knife held tight in both hands held high above his head, he jumped and swung the knife down in one fluid motion, catching the red flesh of the beast and sinking the blade deep and to the hilt. The beast raised his arm and howled as much from shock and surprise as from pain. What is this? And, how dare he? Breathing hard Taddy, held on to the knife handle for dear life. There was no plan. At least nothing beyond getting Gunther and getting him to safety…whatever that meant. He felt himself being lifted from the ground and brought to dangle in front of the beast’s eyes. The beast shook his arm once, then twice before the boy fell free and scurried across the ground to where his friend lay in the mud. He reached over with his hand and plucked the knife from his forearm. He turned it before him to assess the weapon this new boy had come to fight with and found it woefully underwhelming. Taddy nodded aggressively, while backing closer to Gunther who was still trying to crawl away. Taddy nodded again, stirring his courage and wiping at his nose with his arm. “With…this?” The beast flicked the knife at the boy, who scuttled away to avoid being hit as it landed in the dirt at his feet. The boy looked down at knife. The blade glowed with reflection of the orange light still beaming up from the hole in the earth. It looked so very small. So much smaller than he ever imagined. Slowly he traced his vision up from the knife and into the eyes of the new beast. His heart beat filled his chest as if it too were trying to escape. Slowly the air slipped out of his lungs. His shoulders dropped as his hands clenched into the grass. This entry was posted in boys, Fiction, Horror, Human Interest, Slice of life, Uncategorized, Writing and tagged boys, fantasy, fiction, horror, human interest, insightful, original, relationships, slice of life, Tension, writing on March 25, 2014 by The JEFFWORKS.